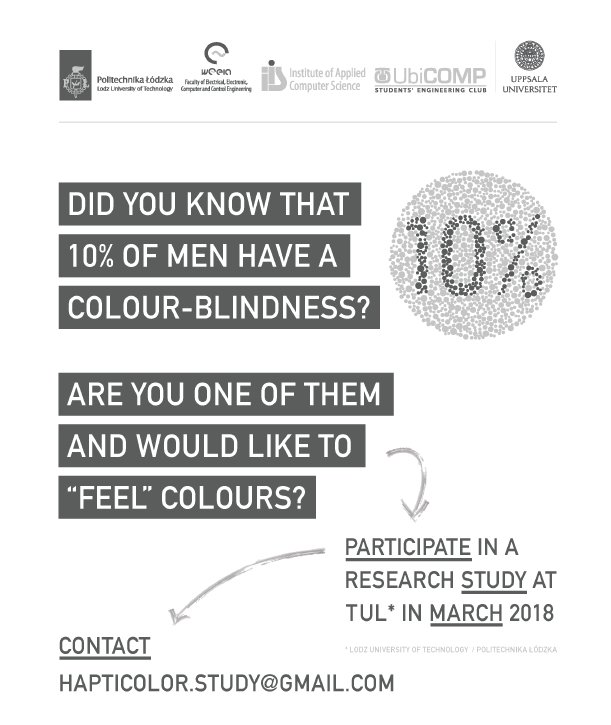 Ten percent of all males live with a colour vision deficiency, meaning their visual perception of colour is limited or absent, causing challenges in their daily lives. 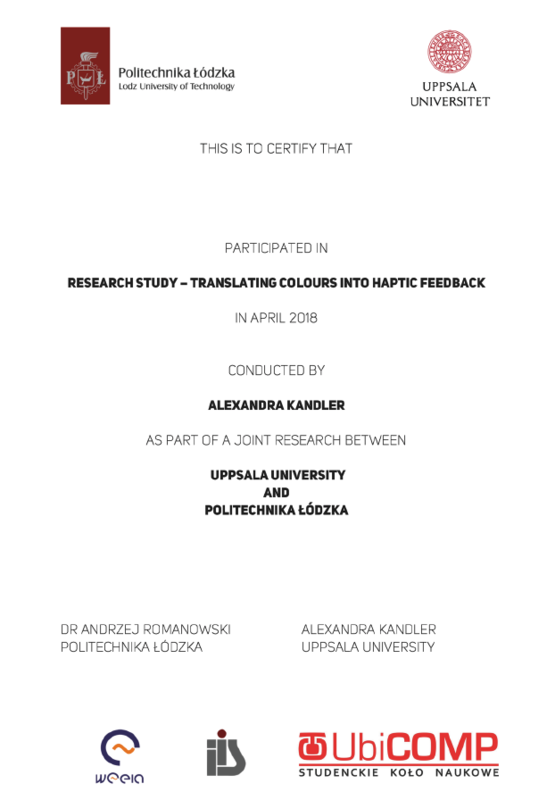 To find out how, and to which extent, haptic feedback can be utilised to communicate information about colour variations while achieving a high accuracy, an iterative interaction design cycle was applied, a functional physical prototype was developed further, five interviews and three user studies were conducted. Translating colours into haptic feedback, the wearable, a wristband, can automatically present a colour’s hue and saturation to the user. 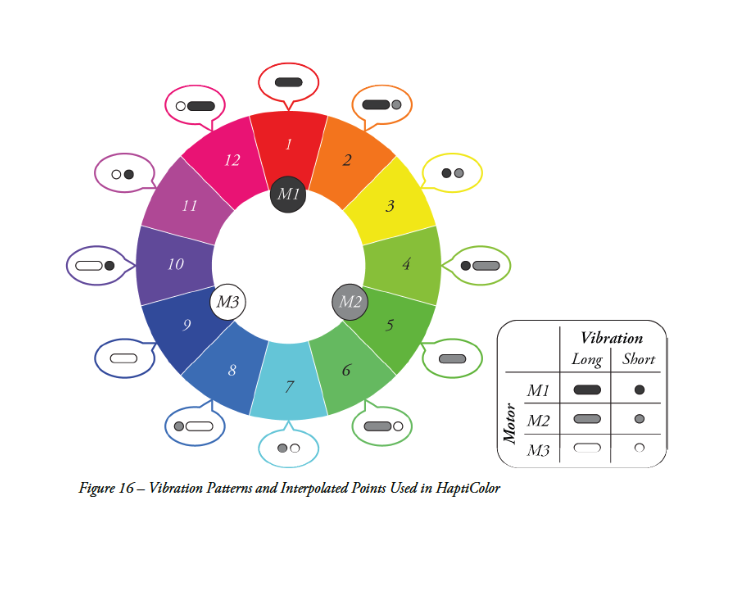 An evaluation with eight colour-vision deficient users found that for some users both hue and saturation are relevant, while for others parameter is sufficient. Hence, the user should be given the option to switch between different settings. The project was conducted by Alexandra Kandler from Uppsala University. She participated in internships in TUL and UbiCOMP Research Group could take part in the extraordinary project. Alexandra and our students conducted User Tests on the working prototype. Each study included four parts: an introduction, two conditions, and a post-test interview (see Table 17). Before each of the two conditions, participants were introduced to the respective condition and a training block helped them get used to the vibration patterns. After training and before the conditions were tested, it was made sure they had no questions. For each participant ten pieces of colourful clothing (see Figure 34) were presented during the two conditions which participants were supposed to scan (see Figure 35) in order to find out the colour’s hue (Condition A), or the colour’s hue and saturation (Condition B). Their order, however, varied between Condition A and Condition B ensuring participants could not remember the order. After finishing each condition, participants were asked to fill out two standardised questionnaires, namely a NASA TLX and a SUS. Additionally, a semi-structured post-test interview followed at the very end. Each participant received a Certificate at the end of the study. Thank you Alex for collaboration!